From spears and pioneers to hurricanes and famous names, explore it all here at Palm Beach County History Online! Palm Beach County History Online is part of our mission to make history accessible, interesting, and meaningful. Our site, which is always a work in progress, was created to help broaden the audience and widen the reach for local history access for those unable to visit the Richard and Pat Johnson Palm Beach County History Museum during operating hours. We aim for the site to become a one-stop shop for all your county history questions. New information will be added periodically. The Historical Society of Palm Beach County thanks the Marshall E. Rinker Sr. Foundation, Inc., and the Community Foundation of Palm Beach and Martin Counties for their foresight in funding the development of this site. Other contributors include: Content research and writing by Lise Steinhauer d/b/a History Speaks, site graphic design by Black Design, and images are from the archives of the Historical Society of Palm Beach County, Loxahatchee River Historical Society, and Henry Morrison Flagler Museum. Technical development of the website is provided by Fusedog Media Group. 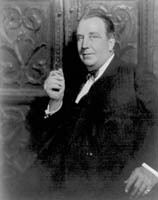 With guest curator, Augustus Mayhew, the Historical Society of Palm Beach County pays homage to Addison Mizner, builder of Palm Beach. The HSPBC’s collection catalog is now online and available for browsing. While not everything in the collections is displayed, this is a great place to begin research or peruse and order photographs. ►Click here to begin your search. We hope you enjoy and share in our unique history. 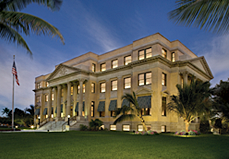 Since its founding in 1937, the Historical Society of Palm Beach County has been the “go-to” resource for history education and research, assembling an extraordinary collection of documents, photographs, and artifacts that tell the fascinating story of the people who made Florida and Palm Beach County an exceptional area to live, work, and learn. The Society has partnered with the School District of Palm Beach County to provide programs for elementary and middle school students. Research in the archives is by appointment, and open to Society members free of charge. Located in the restored 1916 Courthouse in West Palm Beach, the Richard and Pat Johnson Palm Beach County History Museum enriches the lives of children and adults alike by making local history accessible, interesting and meaningful. History comes alive in two permanent galleries and rotating temporary exhibits that reflect the influence of the many cultures in our County’s diverse history, from the earliest Native American inhabitants to the present day. It also explores the natural environment and many communities that have contributed to our County’s distinct identity. 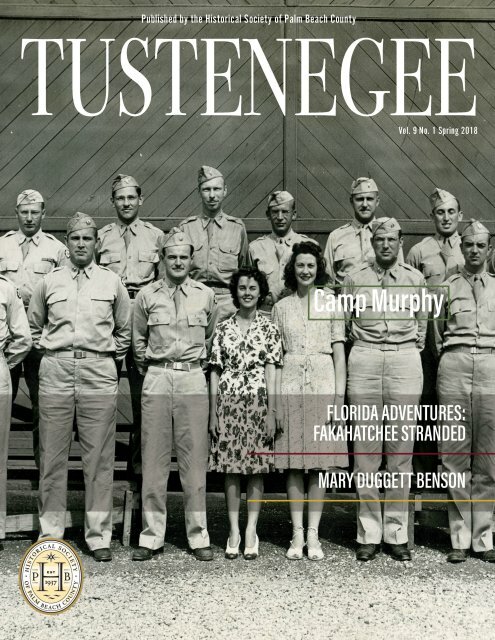 Tustenegee is an online journal of Palm Beach County history published annually by the Historical Society of Palm Beach County. To view or download a copy, click here, or click on journal at the top of the page.